Many thanks for the tip, Troy! Those are both great prices: the Traveler for $47.04 and the Satellit for $156.69 shipped. Timing is great as I’ve had a number of readers ask about purchasing the Satellit lately. Click here to view the Eton Traveler III Executive on Amazon. Click here to view the Eton Satellit on Amazon. This entry was posted in Deals, News, Radios, Shortwave Radio and tagged Amazon, Etón, Etón Satellit, Eton Traveler III, Troy Riedel on March 26, 2017 by Thomas. 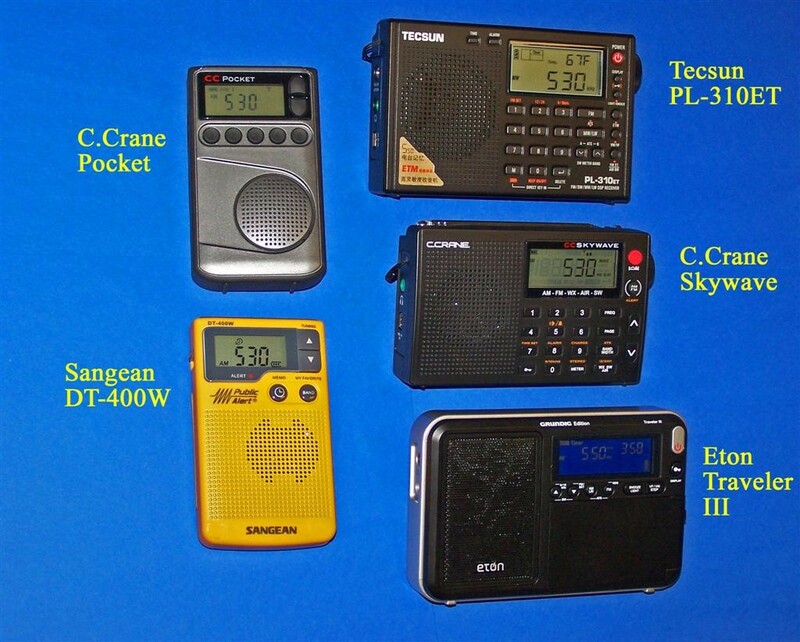 Gary DeBock, acclaimed innovator in the realm of Ultralight DXing, has recently completed a exhaustive comparison of five popular Ultralight radios: the C.Crane CC Pocket, the Sangean DT-400W, the Eton Traveler III, the Tecsun PL-310ET, and the C.Crane CC Skywave. In this excellent guest post, you can read Gary’s full 2015 Ultralight Radio Shootout Review (the most extensive post ever published on the SWLing Post). The shootout includes a review of each radio, and compares performance on each radio’s available band capability. Of course, an emphasis is placed upon medium wave performance. Gary has also included a number of audio clips comparisons which you can download or listen to within the post. Many thanks, Gary, for your in-depth shoot-out! What began as a wildly enthusiastic SRF-59 user group back in late 2007 has managed to sustain worldwide growth for over 7 years, becoming one of the major creative and innovative forces in the AM-DXing community. With foundations laid by the late John Bryant, the Ultralight Radio Yahoo group now boasts over 1,500 members on all continents—united in the challenge of chasing exotic DX with highly advanced pocket radios. Responsible for most of the Ferrite Sleeve Loop antenna experimentation and the spin off sport of ocean cliff transoceanic DXing, the Group’s creative enthusiasm has helped to provide positive momentum for the future of the AM-DXing hobby. Fueled by highly innovative DSP chips, today’s Ultralight Radios can run circles around the pocket transistors that many of us grew up with as teenagers in the 60’s and 70’s. Great improvements in both AM band sensitivity and selectivity have made this class one of the most competitive in the industry, and manufacturers have gone all-out to tap this booming market. 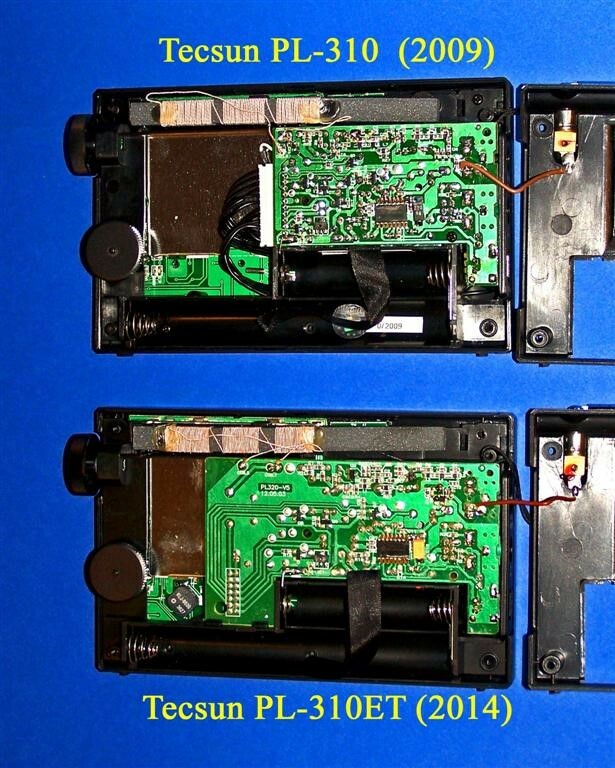 After Silicon Labs’ innovative Si4734 DSP chips were introduced by the Kchibo and Tecsun companies in 2009 the AM band selectivity of pocket radios was dramatically increased, although such models came with congenital quirks such as internally-generated heterodynes. For about four years DXers wondered when a manufacturer would solve this problem, and introduce a pocket radio with both excellent DSP selectivity and freedom from bogus heterodynes. That wait is now over—such a radio is now an exciting reality. One of the unique advantages of Ultralight Radio DXing is the opportunity to sample the latest in innovative technology at a very reasonable cost—and the five pocket radio models chosen for this review include some second generation DSP chip models with astonishing capabilities. Whether your interest is in domestic or split-frequency AM-DXing, FM or Shortwave, the pocket radio manufacturers have designed a breakthrough model for you—and you can try out any (or all) of them at a cost far less than that of a single table receiver. So get ready for some exciting introductions… and an even more exciting three band DXing competition! 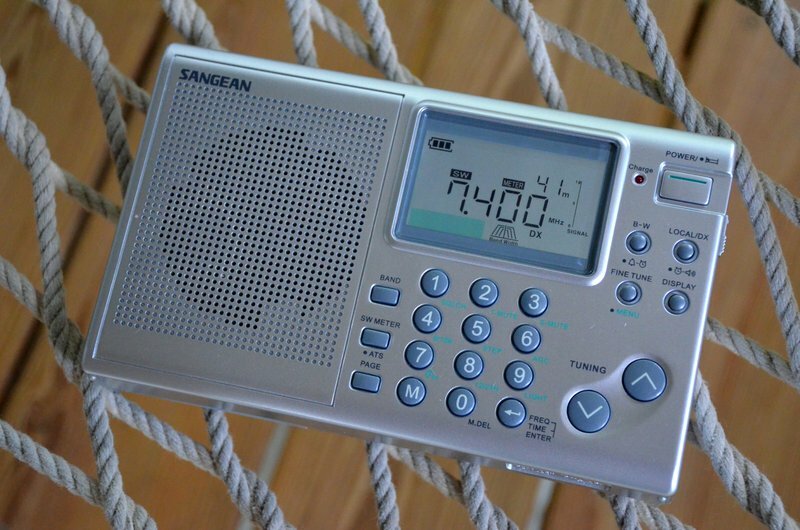 The CC Pocket radio is a vertical form receiver with styling, ergonomics and functions very similar to those of the popular Sangean DT-400W model (the next radio introduced in this Shootout review). Introduced after the DT-400W, the model also includes a few special features which C.Crane obviously hopes will tip the balance for those who are considering which of the two models to choose. The radio includes coverage of the AM (520-1710 kHz), FM (76-108 MHz) and 7 Weather Band frequencies (162.400, 162.425, 162.450, 162.475, 162.500, 162.525 and 162.550 MHz). 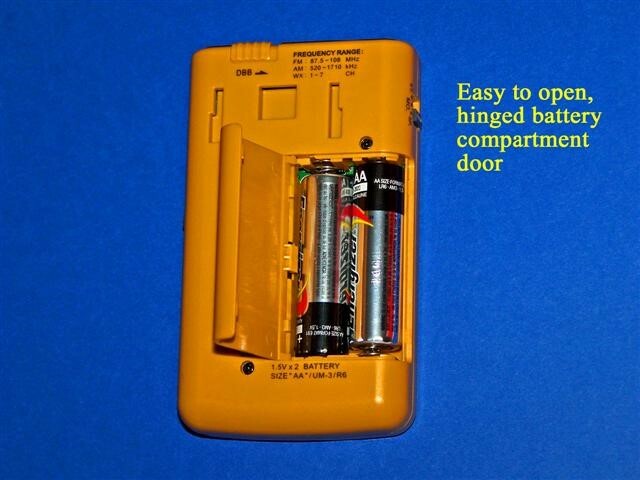 It is powered by two “AA” size batteries, and has a 1.25” speaker capable of 500 mw output. Like most of these vertical form radios the model uses the headphone cable as an FM antenna when the headphones are plugged in, although a plug-in wire antenna is also included to provide FM band reception when the speaker is used. At 2.5” wide x 4.25” high x .9” thick the radio slips easily into almost any pocket, and weighs 3.5 ounces without batteries. A rubber-like trim around the edge of the radio provides a comfortable grip, and a belt clip is attached to the back panel for those who prefer such a mounting system. The radio includes “CC Bud” type earphones, and comes with a one-year warranty. It may be ordered for $64.95 directly from C.Crane or from Amazon. As mentioned previously, the CC Pocket model comes with many added features designed to entice purchasers away from its obvious competition—the Sangean DT-400W model. Some of these features are selectable 1 kHz step tuning, a choice of 2.5 kHz or 4 kHz AM selectivity filters, a choice of time or frequency display, an alarm function, far more memory presets (50 versus 19), a more powerful speaker (500 mw versus 70 mw), wider FM band coverage (76-108 MHz versus 87.5-108 MHz), a longer warranty (one year versus 90 days), and the rubber-like trim around the edge of the radio for a more comfortable grip. On paper, the choice between the models sounds like an obvious one—but how do these additional features stack up in the competitive world of AM and FM weak signal reception? The first step in any radio test is to install the batteries, which is normally a routine operation. Not quite so in the CC Pocket… after trying to slide, pry or coax the battery cover off with my fingers, I finally gave up and grabbed a tool. 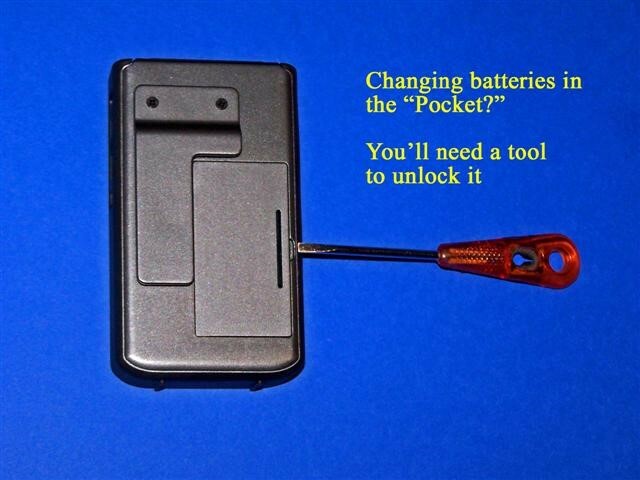 The CC Pocket’s own instructions say to “Remove the battery cover using your fingernail or small tool.” If you purchase this radio, be prepared to use a tool like a small flat screwdriver whenever you change the two AA batteries. When you turn on the radio and search around for fringe daytime DX stations, the lack of a direct entry keypad means that you must use the up or down frequency buttons to tune in stations (as in the DT-400W), which in the case of the CC Pocket goes a little more slowly than in the DT-400W because of the slower tuning rate. Although the CC Pocket has far more audio power through the speaker than the DT-400W, the radio also seems quite a bit more susceptible to indoor RF pollution than the Sangean. For some reason the DT-400W can chase fringe AM-DX stations without any problem adjacent to this computer while I type, while the CC Pocket tends to blank out with computer hash on the same frequencies. Taking the radios outside in the back yard I was curious to test the CC Pocket’s narrow filter function, and see how much it would limit splatter from pest stations. Selecting the 1 kHz tuning steps (which the Sangean does not have) I tuned in the local pest 1450-KSUH, which was splattering all the way to 1438 kHz in the 4 kHz filter setting. Switching to the 2.5 kHz filter setting (by pressing memory buttons 1 and 3 simultaneously) I was kind of surprised to find that 1450-KSUH was still splattering all the way to 1438 kHz, even with the narrow filter setting. I did notice that the CC Pocket did provide slightly better reception of weak stations with the 2.5 kHz filter setting, though, so I used it for the CC Pocket’s reception in the MW Sensitivity and MW Selectivity portions of this 2015 Shootout Review. My impression is that the radio’s narrow filter is more useful for changing the audio tone than it is for limiting serious pest station splatter, which requires an advanced DSP chip. Despite this, even the wide (4 kHz) setting sounds somewhat harsh in comparison to the mellow-sounding DT-400W audio. Like in the DT-400W (and the new C.Crane Skywave), the lack of a selectable display light for continuous illumination in the dark makes DXing at night somewhat inconvenient, although changing any of the controls (except for the volume) will give you about 12 seconds of temporary display lighting. Finally, the CC Pocket has a strange function to disable the display screen “to improve AM radio reception.” After trying out this “feature” in multiple situations, I’m convinced that the only thing it really does is to blank out the display screen. As for the detailed MW-DXing performance of the CC Pocket against the other four radios in this Shootout review, the MW Sensitivity and MW Selectivity portions of the competition will provide all the information that you desire. In general my “test drive” of the CC Pocket was pleasant one, although none of the radio’s added features seemed to give it an edge over the DT-400W in the categories that really count— weak signal MW sensitivity or selectivity. Chasing MW fringe stations with either the CC Pocket or the DT-400W will pretty quickly convince you that these vertical form pocket radios do have some limitations—in order to get the loopsticks away from the digital displays the antennas must be located at the bottom of the cabinets, with their length limited to the width of the cabinet. One of the DXing tricks that sometimes will boost weak MW signals on these radios is to invert the cabinets and hold the bottom sides up, getting the loopsticks up in the air (and away from the grip of your hand). Never shy about promoting its products, C.Crane proclaims the CC Pocket “is able to bring in a weak FM station better than perhaps any other pocket radio.” That is a pretty dramatic claim, and to be charitable to C.Crane, I assume that whoever wrote this had not yet tried out the Tecsun Si4734 DSP chip models like the PL-310ET (covered later in this Shootout review) with their astonishing FM-DXing capabilities. My home location in the valley of Puyallup, Washington is one of the worst possible for fringe FM reception—with high hills on the north, east and south and a mountain range not very far to the west. C.Crane’s FM-DXing claims for the CC Pocket were about to get the acid test! Like the DT-400W the CC Pocket uses the plug-in earphone cable as an FM antenna, although it also includes a plug-in wire antenna for FM reception when the speaker is used. The drawback with this system is that FM reception may be either good, bad or ugly depending upon how the cable is oriented toward the station. During my FM test drive with the radio I had two other competing models along for the ride—the DT-400W and the Tecsun PL-310ET. Plugging in the supplied “”CC bud” earphones I starting checking reception of the usual FM fringe stations here in Puyallup, especially the two Victoria (BC) stations on 98.5 and 100.3 MHz. The CC Pocket had average reception of 98.5-CIOC when the earphone cable was ideally oriented, but reception dropped off quickly whenever the cable was moved to another position. By way of reference the DT-400W has the same FM reception issue (with slightly better overall reception of 98.5-CIOC), although the Tecsun PL-310ET was able to seriously outperform both of these vertical form receivers when its whip antenna was fully extended and positioned at an ideal angle. Checking the reception of 100.3-CKKQ confirmed that the previous situation was typical for FM fringe stations, and that neither the CC Pocket nor the DT-400W could really compete with the PL-310ET in the reception of weak FM signals. The CC Pocket could sometimes compete with the DT-400W however—with roughly equal reception of weak FM stations. Plugging in the supplied wire antennas and switching to speaker use made no difference. On audio quality, though, the Sangean was a runaway winner. Even without the DBB (deep bass boost) feature its audio quality was superior to that of the CC Pocket, with relatively balanced high and low frequencies. With the DBB feature the Sangean’s FM stereo audio quality was truly in another league compared to the somewhat harsh-sounding CC Pocket. For those DXers who also enjoy listening to FM stereo music on their Ultralight Radios, the choice between these two models is no contest. Like the DT-400W the CC Pocket has coverage of the 7 Weather Band Frequencies, and a NOAA Weather Alert function selectable for 4, 8 or 16 hour long periods. The CC Pocket’s reception of Weather Band #2 here in Puyallup is similar that of the DT-400W, although not in the same league as that of another C.Crane product—the new CC Skywave (reviewed later). This bright yellow pocket radio has been a very popular seller since early 2008, in production continuously because of sensible design, good sensitivity and excellent ergonomics. At the time of its introduction it was the first Ultralight radio to offer superb MW sensitivity across the entire band—something that the competing Eton E100 and Sony SRF-T615 models couldn’t quite seem to manage. The bonus inclusion of a Deep Bass Boost (DBB) function added to the radio’s unique appeal. It was first reviewed in the 2008 Summertime Shootout article (click here to download) where its MW sensitivity was then judged to be at the top of the Ultralight Radio class. Although dramatic improvements in DSP chips have enabled newer pocket radios to surpass it in this aspect the appeal of the vertical form receiver remains high, and other manufacturers (like C.Crane, with its CC Pocket) have done their best to introduce similar competing models. The DT-400W includes coverage of the AM (520-1710 kHz), FM (87.5-108 MHz) and 7 Weather Band frequencies. It is powered by two AA batteries, and has a 1 3/8” speaker capable of 70 mw output. The size of the radio is almost exactly the same as the CC Pocket— 2.5” wide x 4.2” high x 1.2” thick, and it weighs 3.8 ounces without batteries. The radio comes with earphones, an FM wire antenna, a belt clip and a 90 day warranty. Like the CC Pocket the DT-400W uses the earphone cable as a plug-in FM antenna, but the supplied wire antenna may be plugged in to provide FM reception whenever the speaker is used. The radio may be purchased from Sears for $57.67 by clicking this link. Unlike the CC Pocket installation of the two AA batteries (with fingers) is a breeze in the Sangean, and the battery cover even has a hinge system to keep it attached to the radio (see photo above). As with the CC Pocket, all tuning must be done with the up or down frequency buttons, but this process goes a little more quickly in the Sangean because of a faster tuning rate. Ergonomically the radio is well designed, and although it lacks the CC Pocket’s rubber side trim the radio feels very comfortable to hold and operate. Even without the DBB (deep bass boost) engaged the DT-400W has very mellow audio, and although the audio amp and speaker are not especially powerful the high audio quality makes DXing with the radio a very enjoyable activity. The DT-400W was at the top of the Ultralight Radio class in MW sensitivity when it was first introduced in early 2008, and it still has very respectable weak signal reception all across the band in consideration of its vertical form and relatively short loopstick (similar to that of the CC Pocket, but with higher audio quality). The DT-400W lacks the dual selectivity filters and 1 kHz step tuning option of the C.Crane model but definitely holds its own in both MW sensitivity and selectivity—even when the CC Pocket is set in the 2.5 kHz selectivity option. The CC Pocket has a much more powerful audio amp and speaker than this model, but the DT-400W’s higher audio quality provides somewhat of a tradeoff in the enjoyment of tracking down weak signals. In the indescribable “fun factor” the bright yellow Sangean seems to have a charm all its own—with popular features and styling that have kept it in steady demand for almost 7 years. Using the Sangean for FM reception will pretty quickly demonstrate to you why this radio has been so popular since its introduction in 2008—when augmented by its DBB (deep bass boost) function, the radio’s stereo audio quality is superb—and as good as it gets in the Ultralight class. Although the enjoyment of stereo FM music may not be the highest priority for FM-DXers, it is a very unusual bonus in pocket radios this size. As detailed in the previous comments about the CC Pocket, the DT-400W’s FM sensitivity and selectivity are roughly comparable to that of the C.Crane model, both with the plug-in earphones and with the supplied plug-in wire antenna (during speaker usage). And as with the CC Pocket, the FM reception on the DT-400W using these plug-in wire antennas will vary from fairly good to nonexistent, depending upon how well the wires are oriented toward the broadcasting station. This type of FM wire antenna is cheap and convenient, but DXers shouldn’t expect to chase serious E-Skip or Tropo with such a humble setup. As during the CC Pocket’s FM test drive a new Tecsun PL-310ET was along for the ride, and when its whip antenna was fully extended and ideally oriented it had no trouble demonstrating a serious FM sensitivity edge oven the Sangean—regardless of which FM fringe station was the target. When a local FM stereo station was received at good strength on both radios, however, the DT-400W turned the tables somewhat by trouncing the PL-310ET in the audio quality of its stereo music reception. Overall the Sangean model is a lot of fun to use on FM, even if its FM sensitivity isn’t quite at the top of the Shootout class. The DT-400W’s Weather Band reception and Alert function is identical to that of the CC Pocket, right down to the selectable 4, 8 or 16 hour Alert periods (somebody at C.Crane must have had a sense of humor, in order to copy this function of the DT-400W so closely). The reception of the Weather Bands and Alerts is through the plug-in wire antenna, which must be oriented properly for good reception. And as with the CC Pocket the DT-400W is only capable of receiving Weather Band #2 here in Puyallup, at a signal level identical to its competing model. C.Crane’s new Skywave model (reviewed later in this Shootout) provides Weather Band reception far superior to either of these models, however. At the time of its introduction in September of 2009 the Tecsun PL-310 model was an immediate DXing sensation—providing not only Ultralight Class-leading MW, FM and SW sensitivity but also breakthrough MW selectivity as well. The new PL-310ET model includes coverage of the AM (520-1710 kHz), LW (153-513 kHz), FM (64-108 MHz) and SW (2.3-21.95 MHz) bands, with multiple digital search functions, 550 memories, multiple display options and many other features. The radio typically comes with a carrying case, owner’s manual, earphones, 3 rechargeable AA batteries and a USB cable. It is available from multiple Chinese and Hong Kong eBay sellers, as well as from Amazon for $49.89 (plus free shipping). Back in late 2008, the innovative Si4734 DSP chip in the PL-310 (and in the related PL-380, PL-606 and PL-505 models) provided a new level of DSP filtering, S/N and RSSI displays and many other advanced features—bringing a basic level of transoceanic DXing capability to the Ultralight Class. Although the PL-310 came with several DSP chip-related quirks like internally generated MW heterodynes, relatively muffled 1 kHz DSP audio and a dubious “soft mute” function to mute weak signals whenever they fell below a certain threshold, DXers were generally willing to tolerate these irritating quirks in order to experience the best MW, FM and SW sensitivity and selectivity that the pocket radio class had to offer. My own 4-Band performance review of the PL-310 at the time (click here to download) was typical of the original glowing praise for the breakthrough model, and like other DXers, I was hopeful that Tecsun and/or Silicon Labs would correct the irritating Si4734 DSP chip quirks in order to make the PL-310 model a true pocket radio DXing legend. Unfortunately, though, it seems like Tecsun had other priorities for this model. 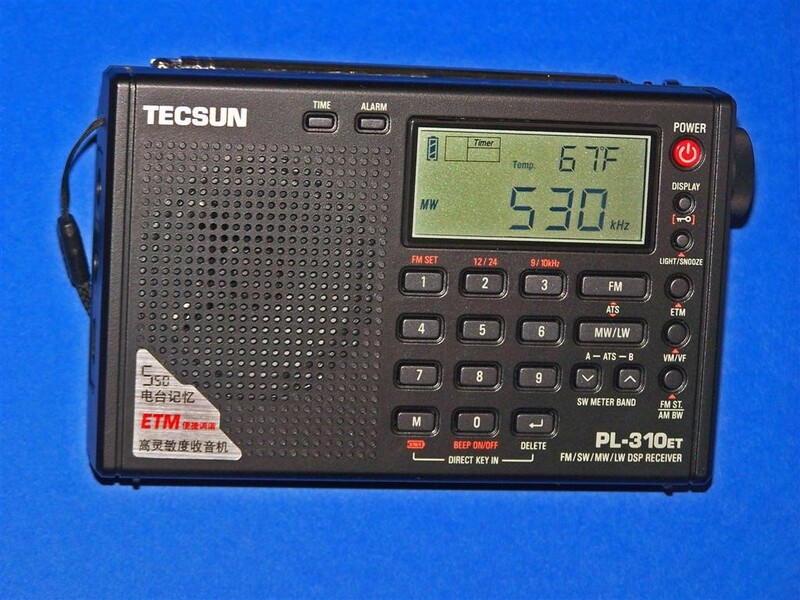 Geared toward the huge Chinese market (with very little DXing tradition or interest), the PL-310 and its related models have already been a big success for Tecsun in the aspect that seems to matter most to them—profit. Instead of working with SiLabs to improve the DSP chip design and address the quirks in the PL-310 and related models, Tecsun seems to have gone in the opposite direction by cutting manufacturing corners in order to increase profits. This has left DXers with even more digital quirks in the newer PL-310 and PL-380 models—and opened up a major new market in Ultralight radios designed to correct these original PL-310 type quirks (like the new C.Crane Skywave and the Eton Traveler III). The new PL-310ET model has all the quirks of the original PL-310 plus a few more… but it also still has very competitive performance (for the price) on FM and SW—and also for MW-DXers who don’t mind dodging the heterodynes, living with “soft mute” and tolerating muffled 1 kHz DSP audio. While DXing with the PL-310ET on MW you basically have a choice between high sensitivity and relatively muffled audio (1 kHz DSP filtering) or lower sensitivity and higher audio quality (2, 3, 4 or 6 kHz DSP filtering). Unfortunately, you cannot have both. With the PL-310ET you can either enter a frequency into the keypad, turn the rotary tuning knob (with the tuning rate switching between 1 KHz and 10 kHz steps depending upon you speed of rotation) or use one of the multiple digital search modes (Easy Tuning Mode, Auto Tuning Storage, Auto Browse, Direct Key in Memory Address, etc.). There are 100 memories available for MW stations (as well as 100 for both FM and LW, and 250 for SW stations). No other Ultralight radio has such advanced tuning capabilities, except for recent similar Tecsun models. Unfortunately, though, the PL-310ET has all of the digital quirks of the original PL-310 on MW, plus a few more. 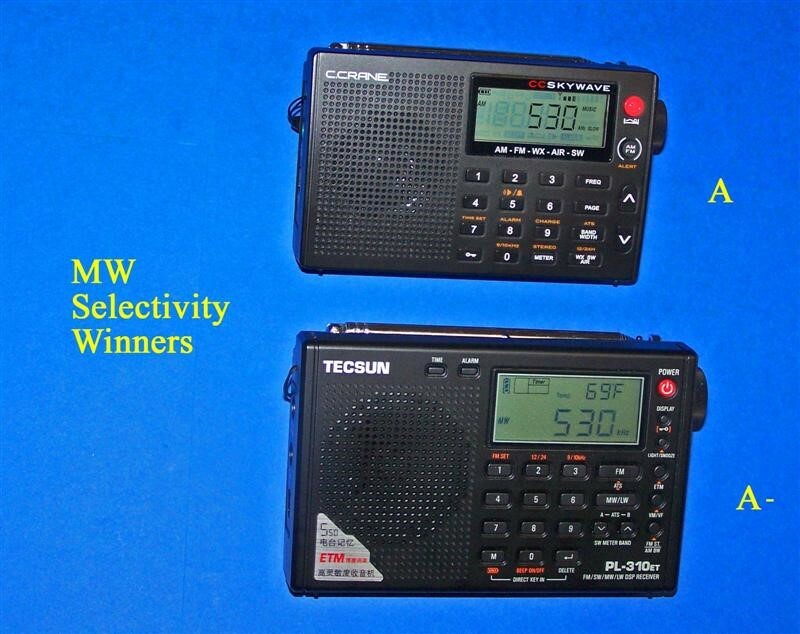 As shown in the photo at right, the model is a complete redesign of the 2009 model, and Tecsun’s cost-cutting shows up in new MW-related issues. The Si4734 chip-generated tuning heterodynes are still on frequencies like 1420, 1430 and 1440, and there is a new issue of digital hash noise whenever you press one of the front panel buttons (like the frequency numerals). When you grasp the original PL-310 with your palm on the display and your fingers tightly gripping the top of the cabinet you will only have an increase in background static—but if you try this with the new PL-310ET you will get a low-level digital whine. The 1 kHz DSP DX station audio in the PL-310 models (both old and new) sounds somewhat muffled, with the higher audio frequencies clipped off by the Si4734 DSP chip. This has been a long-term issue with transoceanic DXers, who frequently record DX station MP3’s during DXpeditions. Side by side comparisons of the PL-310ET and two new competing models (the C.Crane Skywave and Eton Traveler III) provide convincing proof that all of these issues can be either corrected or improved—with both new models correcting the PL-310’s internally generated heterodyne issue, and the C.Crane Skywave providing improved DX station audio in the 1 kHz DSP setting (when the default “Music” tone setting is used). As such, MW DXers in need of 1 kHz DSP selectivity no longer need to tolerate the Tecsun’s bogus heterodynes, muffled audio and digital whine quirks any longer. For transoceanic DXers especially, this is a major breakthrough. Domestic DXers will quickly discover that the PL-310 does have some good points, with selectable displays of RSSI, S/N, temperature (Fahrenheit or Centigrade), time, an alarm function, a selectable light for the display and many other features. The basic question for interested MW-DXers is whether or not they can tolerate the PL-310ET’s internally generated heterodynes, relatively muffled 1 kHz DSP audio, soft mute and moderate digital whine issues. If not, they should direct their attention to one of the new competing models—the C.Crane Skywave (optimized for transoceanic DXers), or the Eton Traveler III (optimized for domestic DXers). How these three models shake out in weak signal MW-DXing will be fully revealed in the Shootout portion of this review. Although the MW performance of the PL-310ET is no longer top of the line, the good news is that the FM performance of the PL-310ET is as good as ever. 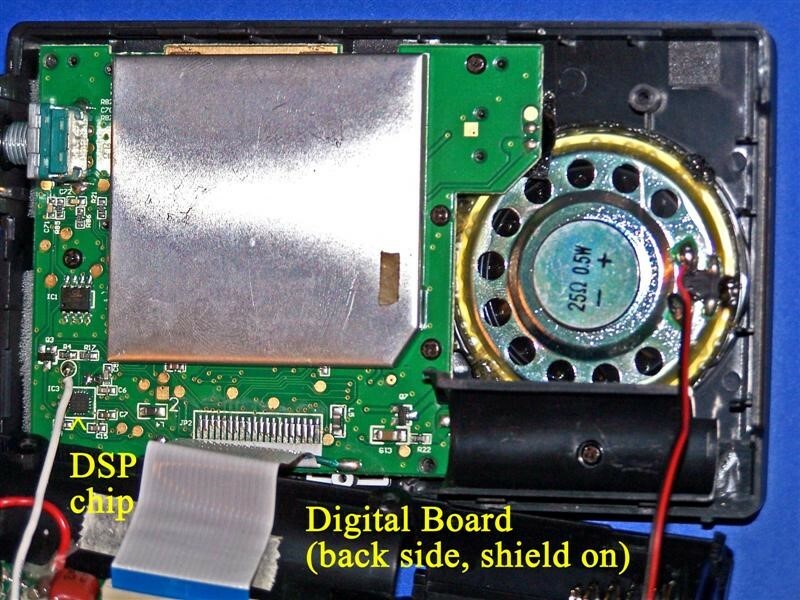 The Si4734 DSP chip has earned a very impressive reputation in FM sensitivity and selectivity since it was introduced in 2009, and the PL-310ET continues to dominate the Ultralight radio field in this capability (along with its brother PL-606 model, which has the extended whip antenna). The new models which compete so successfully with the PL-310 in MW-DXing fall flat in FM competition, limited either by their shorter whip antennas, less sensitive DSP chips or both. On any fringe FM test station the PL-310ET easily demonstrates its superiority in FM sensitivity—so long as its whip antenna is ideally directed at the fringe station. This does take a little bit of experimentation, but once the PL-310ET’s whip antenna is oriented properly it can almost always humble any of the other competing Shootout models in weak signal FM reception. The radio’s FM stereo audio quality is acceptable, but for true music lovers it will not come close to the superb audio fidelity of the Deep Bass Boost-enhanced Sangean DT-400W. Once again, the Tecsun model demonstrates that it still has a lot to offer. None of the competing models can match the PL-310ET in Shortwave sensitivity, where the radio has a weak signal reception edge all its own. The competing models seem limited (once again) by shorter whip antennas, less sensitive DSP chips or both. 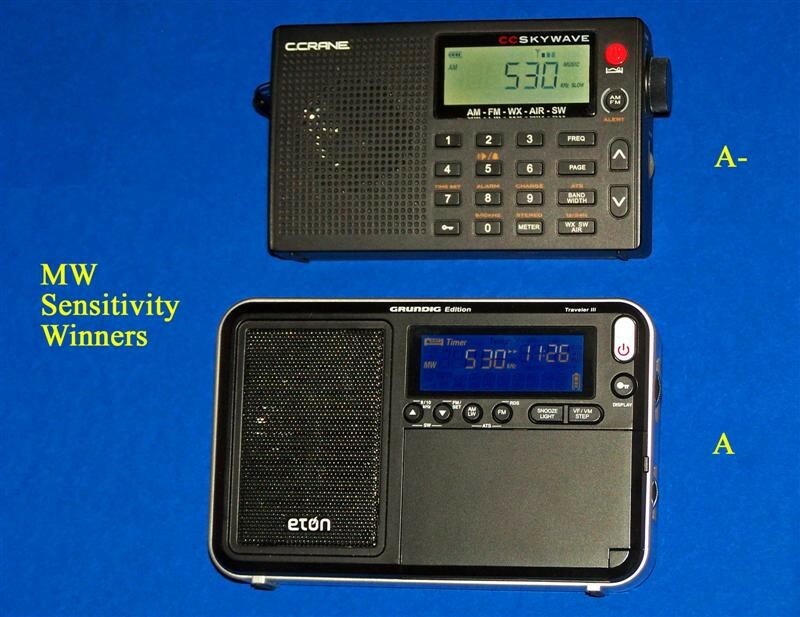 One gets the distinct impression that C.Crane and Eton included Shortwave coverage in the Skywave and Traveler III models primarily because it is expected by purchasers, but neither manufacturer seems to have made a serious effort to improve upon the excellent Shortwave performance of the Si4734 DSP chip in the PL-310 and related models. Their competitive effort seems to have been concentrated (successfully) in Medium Wave performance—leaving the PL-310ET the champion of Ultralight Shortwave reception. The 250 Shortwave memories and multiple digital search functions only add to the radio’s appeal in this popular capability. The PL-310ET does not have Weather or Air Band coverage, but it does offer Longwave coverage from 153-513 kHz. The radio is a real clunker in Longwave reception, however, with a loopstick obviously designed for the MW frequencies. 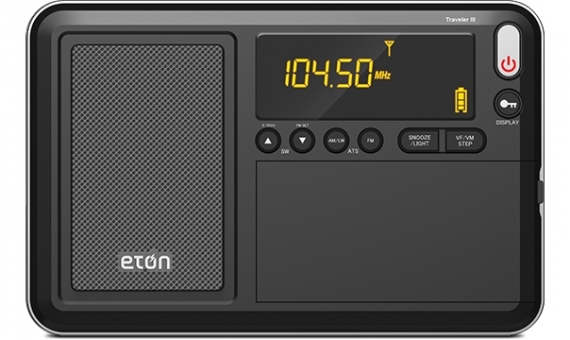 Nobody should purchase this radio (or the new Eton Traveler III) with hopes of receiving serious Longwave DX. As an example, the radio cannot even receive a trace of my local NDB pests on 216 and 328 kHz at any time of the day or night. There is an effective Longwave loopstick designed especially for the Tecsun DSP Ultralight radio models, however (with details posted here–click to download) that will transform any of the Tecsun Longwave models into serious DXing performers. 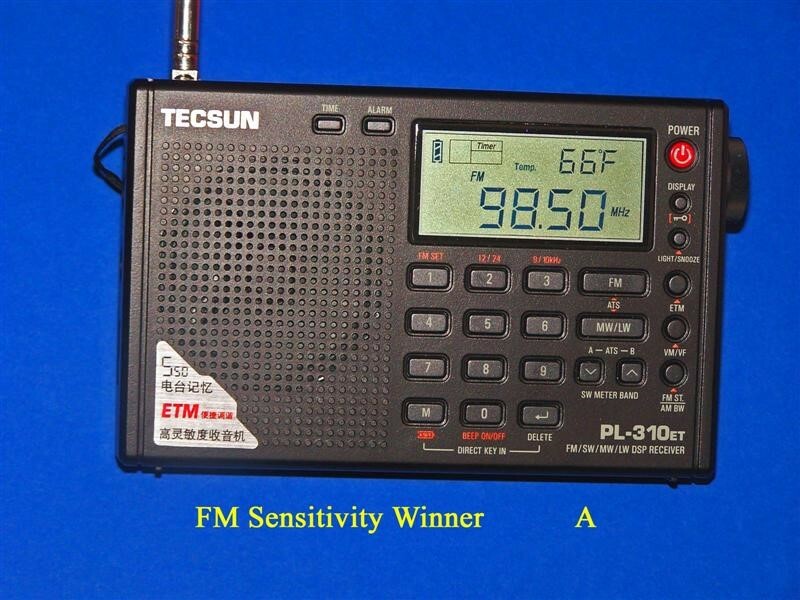 Although Tecsun has shown no interest in correcting the MW-DXing digital quirks in the PL-310, PL-380 and related models, the excellent news is that another major manufacturer has definitely been paying attention to DXers’ wishes—creating a new model that succeeds in correcting them all. The C.Crane Skywave almost seems custom-designed for serious MW-DXers—solving the internally-generated heterodynes and soft mute issues of the PL-310, and improving upon the muffled 1 kHz DSP audio problem as well. It also offers wide-band FM coverage, outstanding Weather Band sensitivity and bonus Air Band coverage—at a price. The new Skywave model appears to be a custom project of C.Crane, and the $89.95 price (before shipping) probably reflects the company’s high research and development costs in creating such an innovative model. The C.Crane Skywave’s appearance might seem similar to that of the Digitech AR-1733, but interested purchasers should not be misled by this fact. The Skywave is a total redesign of that earlier model—which C.Crane apparently used as a starting point for their custom Skywave project. It has custom circuit boards (designed by C.Crane, and assembled by its Redsun partner, in China), two DSP chips, strong build quality and weather-resistant construction. 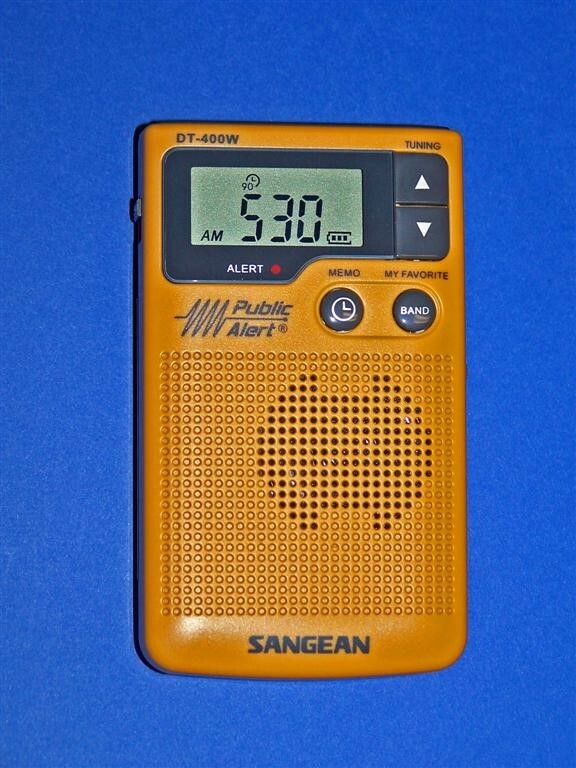 The model includes coverage of the AM (520-1710 kHz), FM (76-108 MHz), SW (2.3-26.1 MHz), AIR (118-137 MHz) and 7 Weather Band frequencies (with a Weather Alert function, selectable for 4, 8 or 16 hours). The radio comes with an owner’s manual, carrying case, warranty card (one year) and CC Bud earphones. The C.Crane Skywave model is available for $89.95 plus shipping from either from Amazon or directly from C.Crane. Although the Skywave includes several digital improvements over the PL-310 and other Tecsun DSP radios C.Crane makes no attempt to match the multiple digital search functions and display options offered by the PL-310 and related units—and the user will quickly discover that simplicity and basic function is the order of the day. There is only one digital search mode (ATS), no selectable display light (although pressing one of the controls will get you about 12 seconds of temporary lighting), no volume level display, only 100 memories (which the owner’s manual does not tell you) and a very basic bar graph display of signal strength. Of course, none of these limitations will matter very much to MW-DXers (especially split-frequency DX enthusiasts) who have waited many years for a manufacturer to correct the digital quirks degrading the Tecsun DSP Ultralight models. The Skywave and the competing Eton Traveler III model (reviewed next) set new MW-DXing standards for those hobbyists who want class-leading sensitivity, no “soft mute” signal dropouts and complete freedom from bogus heterodynes. C.Crane’s target group for this new model includes transoceanic and domestic MW-DXers who love the Tecsun PL-310’s (and PL-380’s) breakthrough DSP selectivity but hate the model’s digital quirks—and if you fall into this category, then you are in for a real treat! The Skywave’s excellent MW sensitivity is augmented by its complete freedom from bogus heterodynes and “soft mute,” and it provides 1 kHz DSP selectivity every bit as effective as the Tecsun radios—with improved audio clarity as well. Chasing the same MW fringe stations with the Skywave and PL-310ET model side by side immediately reveals a significant gap in overall performance…wide enough to convince most MW-DXers that the PL-310ET has become second rate. When both models are set in the 1 kHz DSP setting (which also provides maximum MW sensitivity on both models) the PL-310ET seems bogged down by its muffled audio, mystery heterodynes and bizarre tendency to silence a fringe station when it becomes too weak (which is a particularly irritating quirk for dedicated DXers). The Skywave excels in correcting all these issues, but as mentioned before, the emphasis is on simplicity—and the model lacks several of the PL-310ET’s display functions (RSSI, S/N, temperature in F or C, volume level and a selectable display light), digital search functions and memory capacity. The Skywave’s audio amplifier is also slightly underpowered in comparison to the competing models, and does tend to max out on weak stations more readily than that of the PL-310ET or the Eton Traveler III. In combination with the Skywave’s lack of any volume level display, this can mean quite a few trips to the upper stops of the analog volume control. Finally, it does need to be emphasized that C.Crane’s Skywave is not the only new Ultralight radio designed to correct the Tecsun models’ DSP chip quirks—the new Eton Traveler III also corrects them, and does so quite effectively at a price lower than that of the Skywave. For MW-DXers interested in both of these new models, the deciding factor will probably be whether 1 kHz DSP selectivity is a high priority. The Skywave provides it very effectively, while the Traveler III lacks any selectivity choices. 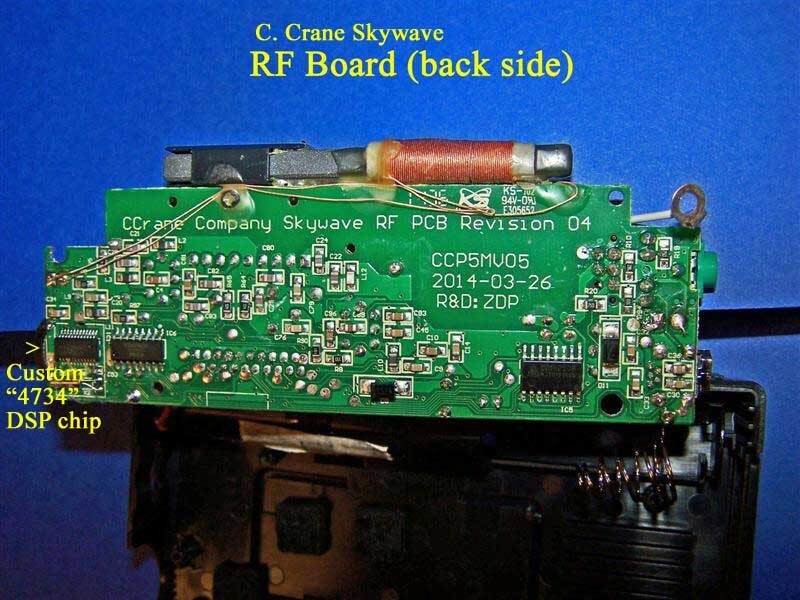 In summary, though, for Medium Wave transoceanic DXers eager to push their Ultralight DXing luck for all it is worth, the new CC Skywave is the radio that we have been waiting for—despite its weak points. Although C.Crane’s refinements really provide a DXing edge for the Skywave over the PL-310ET on Medium Wave, it seems that superior FM performance was not part of C.Crane’s research and development program. The FM sensitivity and selectivity of the Skywave fall somewhat short of the PL-310ET’s standard, leaving the model with average performance in fringe station reception. As with the PL-310ET it is necessary to orient the whip antenna in the optimal direction for best reception, but even with the utmost effort in doing so the model’s weak signal reception never quite matches that of the Si4734 DSP chip in the PL-310ET. The Tecsun’s 100 FM memories matches the entire total for the Skywave model, and the PL-310ET’s multiple display functions make the Skywave look pretty rudimentary. The PL-310ET offers wideband (64-108 MHz) FM coverage, while the Skywave offers only the domestic North American frequencies (87.5-108 MHz). The PL-310ET’s superior audio amp also makes a difference when signals get really weak, and its digital search modes are superior. Since the MW band advantages detailed above are irrelevant on FM frequencies, the model really falls short of the PL-310ET’s standard in FM-DXing performance. It does compete quite effectively with the other contestants in this competition, however. 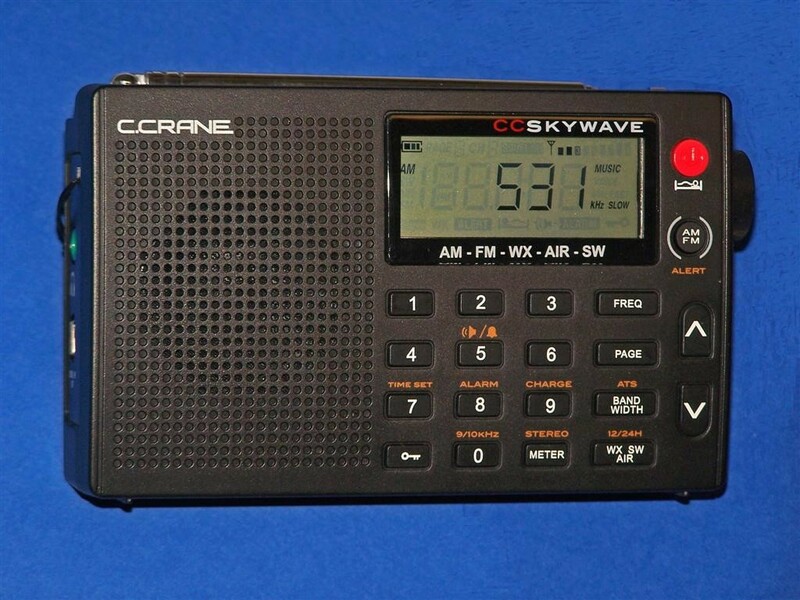 In competition with the PL-310ET the Skywave’s Shortwave sensitivity also falls short of the mark, although the C.Crane model does have some minor advantages on these bands. It offers wider frequency coverage (2.3-26.1 MHz, compared to 2.3-21.95 MHz for the PL-310ET), and its 1 kHz DSP audio sounds superior to the somewhat muffled 1 kHz DSP audio in the PL-310ET. With the sad situation of fewer and fewer Shortwave stations continuing to broadcast, however, the need for superior selectivity on the Shortwave bands isn’t so important anymore. Because fewer stations are broadcasting the PL-310ET can almost always be set in the 2 kHz DSP setting for improved DX station audio without facing the drawback of side channel interference. The Skywave’s Shortwave sensitivity allows it to receive most of the same stations but at less signal strength than that of the PL-310ET. Similar to the situation on the FM band, the PL-310ET has far more display options, memories (250 on Shortwave alone, versus 100 total in the Skywave) and digital search modes—as well as a more powerful audio amplifier. Dedicated Shortwave DXers will probably find the Skywave to be a little too basic to meet their needs, despite the wider coverage on the higher frequencies. Once again, though, the Skywave’s Shortwave performance is in the same ballpark as that of the new Eton Traveler III—the next model up for review in this article. Either one of these new models should have acceptable Shortwave sensitivity for the reception of typically strong SW station parallels of MW mystery stations. 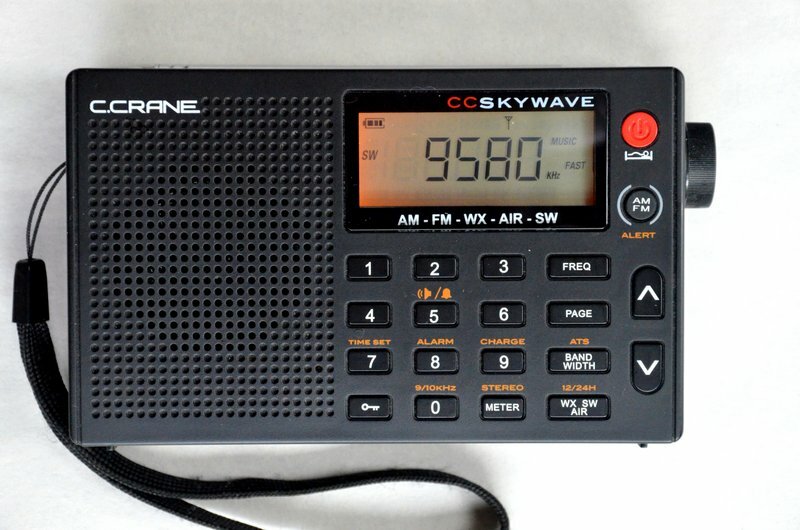 The CC Skywave really excels on two other bands– one of which is unique in the Ultralight radio class. Its Weather Band sensitivity is far superior to that of the CC Pocket and DT-400W models, and it has the same Weather Alert function and selectable time periods (4, 8 or 16 hours) as those vertical-form models. Weather Band reception which is dicey on the smaller models is usually crystal clear on the Skywave—most likely because of the dedicated DSP chip for Weather and Air Band reception in the model. If any reader places an extremely high priority on the stable reception of Weather Band alerts during emergencies, this is definitely the Ultralight radio of choice. Not only is the whip antenna far superior to the makeshift wire antenna system of the vertical-form models, but the DSP chip-provided sensitivity is in an entirely different league. Finally, one of the obvious attractions of the CC Skywave model is its AIR Band coverage from 118-137 MHz—unique in the Ultralight radio class. According to information from C.Crane., the Si4736 DSP chip on the digital board is used strictly for Weather and AIR Band reception—and it definitely provides excellent sensitivity on both of those bands. To get started in listening to communication between airports and airplanes the owner’s manual instructs the user to check the internet for airport frequency listings, specifically mentioning the http://www.flightradio.com site. After checking that site (and paying a $10 fee for “lifetime membership”) I was able to download a file with airport communication frequencies for the entire USA, which is posted here. My home town of Puyallup, WA is along the direct southerly approach route for Seattle-Tacoma International Airport—a pretty busy site with lots of air traffic. The frequency listings mentioned a SeaTac tower frequency of 119.900 MHz, which is used by the tower to receive communication from airplanes approaching the airport and requesting a runway assignment. Depending upon air traffic, the time of day and luck, the CC Skywave can receive either a lot, a little or almost no communication on this tower frequency. Since only communication from airplanes is heard, the signal strengths can vary from a thunderous level (for planes directly overhead) down to a ghostly wisp (for airplanes many miles away). Below, you’ll find a sample MP3 of the Skywave’s reception on this 119.900 MHz SeaTac tower frequency (with communication from three airplanes within two minutes). Click here to simply download this MP3. The CC Skywave has a Squelch function which will mute the background noise on the AIR band frequencies while you await voice traffic—which is engaged by pushing in the tuning control for two seconds, then rotating the control to choose your desired threshold level. This is a nice feature for those who only wish to hear the voice communication, but it does reduce the radio’s reception sensitivity somewhat. In general the Skywave’s AIR Band coverage is a major plus for those interested in airport communication, although these types of transmissions are almost always brief, businesslike, and to the point. Listeners should not expect any of the emotion and drama typical in airport disaster movies! Another innovative model providing breakthrough MW-DXing performance is the new Traveler III—which in stock form is quite possibly the most capable domestic DXing pocket radio on the planet. Although Eton has also managed to correct the most troublesome digital quirks of the PL-310 and related Tecsun DSP models on Medium Wave (bogus heterodynes and soft mute), unlike the CC Skywave the Traveler III makes no attempt to offer improved DSP selectivity. Instead it takes innovation in a different direction—by concentrating on the best possible MW sensitivity, and by its breakthrough inclusion of an RDS display on the FM Band (an Ultralight radio first). With only a single selectivity choice on the MW band (which is roughly equivalent to the CC Skywave’s 2 kHz DSP setting in filtering performance) the Traveler III is unlikely to attract much interest from split-frequency transoceanic DXers. But its breakthrough MW sensitivity makes it a very formidable contender for the attention of all other Medium Wave DXers—especially those who appreciate its unique, stylish appearance. There is only one digital search choice (ATS), and like the CC Skywave, the manual doesn’t tell you how many memories the radio provides (apparently 100, like the Skywave). But it does include a selectable display light—with a duration of up to 10 minutes. The Traveler III includes coverage of the AM (520-1710 kHz), LW (153-513 kHz), FM (87-108 MHz) and SW (2.3-26.1 MHz) Bands. Provided with the radio is an owner’s manual (in five different languages) and carrying case. There are no earphones or warranty card provided, although when you check at the manufacturer’s web site you are informed that the Traveler III’s warranty is for one year. The radio may be purchased for $59.99 (with free shipping) from Amazon by clicking this link. In general, the Traveler III has an appearance and function quite unique among recently introduced pocket radios, with an attractive aluminum-colored trim around the cabinet edge, and a whip antenna mounting post extending horizontally from the back cabinet. It has a front panel world time selector switch hidden behind a hinged door (opening downwards), and a unique display with orange characters on a dark gray background. The model is the only Ultralight radio to use four AA batteries—surely giving it unparalleled DXing endurance. Perhaps the most unusual point is the lack of any selectivity choice—putting the radio at a competitive disadvantage with the Tecsun 1 kHz DSP ultralights and the new CC Skywave in this aspect. However the Traveler III does have quite a lot going for it, especially for domestic MW-DXers who don’t need to chase split-frequency DX targets. Both the MW sensitivity and tone quality are first rate—and the stylish appearance and reasonable price should attract quite a dedicated audience. Its new Si4735 DSP chip also provides FM-DXers with an Ultralight radio class breakthrough—an RDS display with multiple data choices. The Traveler III’s target group includes those MW-DXers who place a high priority on both excellent sensitivity and audio quality. The radio provides an outstanding combination of both— and although there are a few digital quirks that need to be tolerated, in general the Traveler III makes it a real pleasure to track down weak MW signals. First we will cover the quirks. Since there is no direct entry keypad you will need to rotate the tuning knob to choose your frequencies. The knob is capable of covering wide ranges quickly if you rotate it with some speed, and it is also capable of accurately tuning in 9 or 10 kHz steps if you rotate it slowly. The volume control has a digital display level, but each time you adjust the volume control you will get a short burst of soft digital hash noise whenever the volume level changes a step (i.e., don’t try to change the volume level during recordings). Finally, changing the frequency will cause the audio to drop out for about one second, then come back in a rush. If you can tolerate these digital quirks, though, you will discover that the radio has a great deal to offer the MW-DXer. Sensitivity is exceptional (the specifications list it as less than or equal to 1mv/m), and although there is no choice of audio tone, the radio’s tone is almost high fidelity as delivered from the factory. Like the PL-310ET the radio has both a pretty powerful audio amp and a volume level display, and in combination with the excellent audio fidelity this feature really helps to dig out the weak stations (although advancing the volume knob up to the maximum will give you those soft digital hash sounds, as mentioned previously). The Traveler III also has exceptional nulling ability for a stock pocket radio—and is the first one ever tested here which is able to null out the semi-local pests on 570 and 710 kHz to pull in weak stations on the same frequency. So how much does the single selectivity choice limit the Traveler III’s ability to go after weak MW stations next to strong locals? For domestic DXers (and for transoceanic DXers lucky enough to live on an isolated ocean beach in Carbonear, Newfoundland) probably not so much. As mentioned before, the single selectivity choice provides filtering roughly equivalent to the 2 KHz DSP setting in the CC Skywave, which in combination with the radio’s exceptional nulling ability provides a decent chance to go after almost any domestic station (please refer to the MW Selectivity Shootout MP3’s for further details). For most of the transoceanic DXers who routinely push their luck chasing 9 kHz-split targets adjacent to troublesome domestic pests, however, the Traveler III’s single selectivity choice will probably be unacceptable. In most parts of North America (and Europe, for that matter) there is simply too much domestic splatter across the band to have much success in chasing weak transoceanic DX without effective 1 kHz DSP filtering—such as is provided by the new CC Skywave or the Tecsun PL-310ET (and PL-380). Even with this 1 kHz filtering, traces of domestic splatter still show up on most of the transoceanic DX MP3’s recorded here at this western Washington location. In the very rough mission of pocket radio transoceanic DXing, you need every possible advantage—including the best possible 1 kHz DSP filtering. Continually trying to chase split-frequency DX without it will probably bring you a serious case of grief. First, the good news. As mentioned previously, the Traveler III is the first Ultralight radio to feature an RDS display on FM, provided by its Si4735 DSP chip. When an FM station is transmitting RDS data and is of sufficient strength, the radio is capable of providing a display of either “PS” (program name), “PTY”(program type), “RT” (program text) or “DATA” (time, date, weekly program and call sign). A quick press of the “RDS” button allows you to toggle between these displays—assuming that the FM station is transmitting all the data. In practice, many FM stations either do not transmit all of this data, or may not transmit any RDS data at all. You need to wait for a small “RDS” icon to show up on the display prior to using the system. In any case, solid FM reception is required for the Traveler III to display any RDS data—a factor which limits the system further. Unlike on the MW band, changing the radio’s volume control on the FM band does not result in short bursts of digital hash between the volume level steps. The radio’s FM audio quality sounds fairly average through the speaker, with the emphasis on treble response. 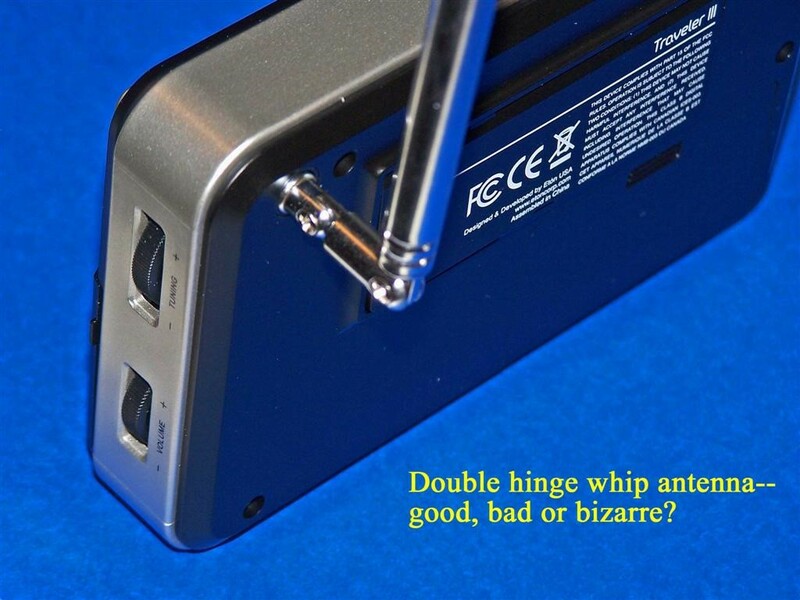 The whip antenna’s mounting post extends horizontally from the back cabinet, and has an unusual double-hinge system which may either be convenient or tricky, depending upon your personal preference (see photo above). My own impression is that this type of antenna may not survive a careless owner. Finally, at only 16” the whip antenna is unusually short, in comparison to the 19” of the CC Skywave and the 21.5” of the PL-310ET. Along with DSP chip differences this translates into weaker FM sensitivity than that of the PL-310ET, although the Traveler III is pretty competitive with the other review models in this aspect. If a dedicated FM-DXer augmented the radio with an effective external antenna the Traveler III’s RDS system might become a major plus, but in stock form the radio’s limited FM sensitivity makes this new feature seem rather compromised. Like the CC Skywave (and unlike the PL-310ET) the Traveler III provides Shortwave coverage all the way up to 26.1 MHz – although like the Skywave, breakthrough Shortwave sensitivity doesn’t seem to be part of the radio’s master plan. With the shorter whip antenna and single selectivity choice the Traveler III’s Shortwave performance ends up below that of the PL-310ET, but it can compete with the CC Skywave and most other Ultralight radios fairly well on the SW bands. Changing the volume control steps does not generate the short bursts of digital hash like it does on the MW frequencies, and the audio amplifier is powerful enough to check out most of the weak SW stations. Like on the FM band, the short (16”) whip antenna is hardly optimum for good Shortwave sensitivity, and any serious SW-DXer would wish to either upgrade the antenna or opt for a different model to begin with (like the PL-310ET, or one of its 1 kHz DSP siblings like the PL-380, PL-505 or PL-606). In general the Traveler III provides acceptable Shortwave sensitivity for checking powerful parallel stations of mystery MW-DX signals, but Shortwave performance is not this model’s strong point. The Traveler III has no Weather Band reception, but it does include Longwave Band coverage from 153-513 kHz. Unfortunately (like the PL-310ET), the loopstick is optimized for the Medium Wave frequencies—resulting in deaf sensitivity across the entire Longwave spectrum. Neither the Traveler III nor the PL-310ET can receive a trace of my local NDB pests on 216 or 328 kHz (or any other Longwave stations)—even around local midnight. 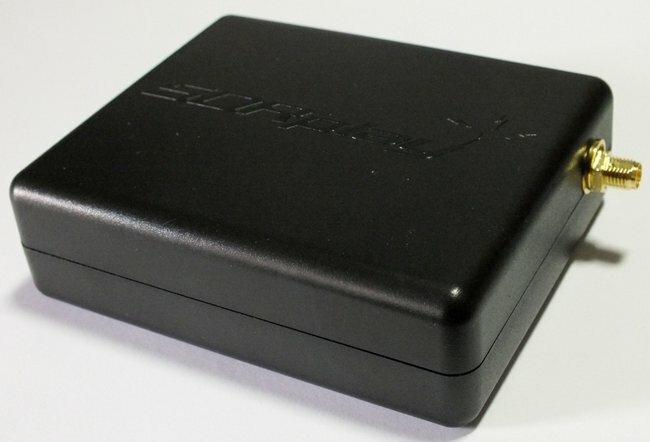 Unless you have the technical ability to replace the loopstick or connect an effective Longwave external antenna to the model, you should consider this Longwave “coverage” to be completely useless. For the first time in any competitive radio review, multiple test signal MP3’s were recorded to give each reader a chance to listen to accurate evidence of the relative performance of each model in important categories. These categories were MW sensitivity, MW selectivity, FM sensitivity, Shortwave sensitivity and Weather Band sensitivity. For the MW Sensitivity test MP3’s weak daytime DX fringe stations were chosen and recorded during hours close to local noon, emphasizing stable ground wave propagation. The daytime DX stations were chosen because of the challenging nature of their signals, which cannot be received on pocket radios without above average sensitivity. Each radio had an equal chance to demonstrate its sensitivity, with all the test signals being recorded within a 5 minute period (during which a stable test signal was ensured), and all loopsticks were oriented in the same direction. Finally, the radios were switched around to ensure that no position was inferior or superior to any other position. The CC Pocket was placed in its narrow (2.5 kHz) filter setting and the Tecsun PL-310ET and C.Crane Skywave models were placed in their 1 kHz DSP settings (all of which were found to provide the best sensitivity and selectivity for the three models). The Skywave was set in its default “Music” tone selection. In all the Medium Wave test signal reception MP3’s, the CC Pocket is recorded for the first 15 seconds, followed by the Sangean DT-400W for approximately 15 seconds, followed by the Tecsun PL-310ET for approximately 15 seconds, followed by the C.Crane Skywave for approximately 15 seconds, followed by the Eton Traveler III for 15 seconds. The CC Skywave and the Traveler III tend to break away from the pack receiving the weaker stations, with the edge going to the latter because of its superior audio clarity. The Eton’s combination of excellent reception and high audio fidelity makes it the new Sensitivity Champion in the Ultralight radio class, although the CC Skywave is right behind it. The PL-310ET has fairly good sensitivity but is limited by its relatively muffled audio in the 1 kHz DSP setting, while the CC Pocket and DT-400W can’t quite keep up with these larger models because of their shorter loopsticks. My own impression was that the DT-400W had a slight edge over the CC Pocket, but neither of these models are paragons of sensitivity in the current Shootout group. The CC Pocket’s poor reception of 1070-CFAX was a puzzle—the DT-400W had it at a fairly good level. The Sangean also clearly outperformed the CC Pocket in the 1470-KELA reception. 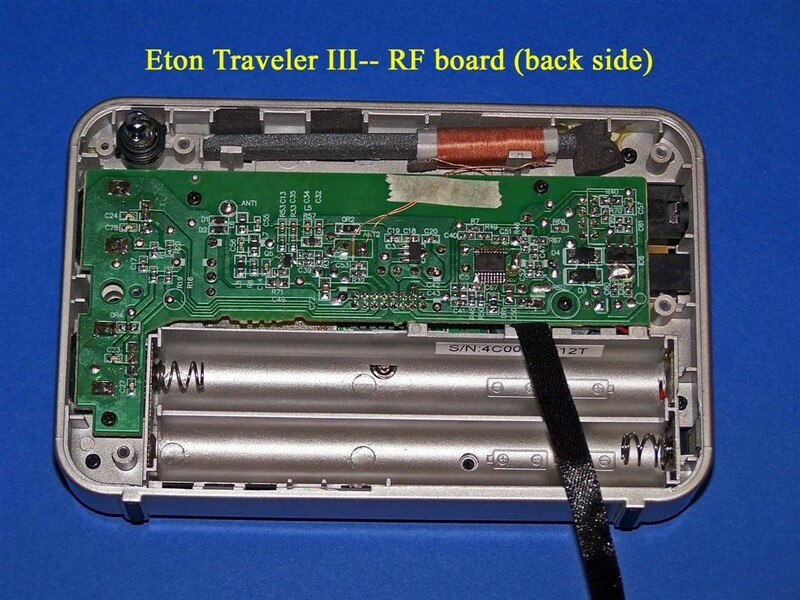 Overall any of these models would be acceptable for routine DXing, but the Eton provides superior weak signal reception at a superior price. During this competition the five competing models were given the very challenging task of receiving weak daytime DX stations very close in frequency to strong local stations. Because some of these stations were quite weak around local noon the test was run a few hours later in the afternoon, but stable daytime DX test signals were still ensured prior to each runoff. In order to maximize reception of the weak fringe stations, the loopsticks of all the competing models were oriented to null the local pest station as much as possible. Once again, in each MP3 the first 15 seconds are recorded on the C.Crane Pocket, followed by approximately 15 seconds on the Sangean DT-400W, then approximately 15 seconds on the Tecsun PL-310ET, followed by approximately 15 seconds on the C.Crane Skywave, followed by 15 seconds on the Eton Traveler III. Both the CC Skywave and the Tecsun PL-310ET excelled in the twin tasks of rejecting local splatter and digging out weak audio, but the CC Skywave had the edge in the 1010 and 1550 kHz receptions. The PL-310ET also came up with weak, bogus heterodynes on 690 and 1010—not exactly helpful. The radios without 1 kHz DSP selectivity were generally outclassed in this competition, although the Traveler III’s outstanding nulling capability gave it unexpectedly good performance in the 700, 860 and 1010 receptions. Even without 1 kHz DSP filtering, the Eton can generally survive these rough tests when the pest station is about 90 degrees away from the DX station, and its superior nulling capability can be brought into play. The DT-400W generally had a rough time, although its selectivity was clearly superior to that of the CC Pocket—despite the latter’s 2.5 kHz “narrow filter.” Curiously, although the C.Crane Skywave is the new MW Selectivity Champion, its CC Pocket sibling brings up the rear. For this competition weak FM fringe stations were chosen to provide a challenging test for each model’s FM sensitivity. The tests were conducted in the open back yard, with each model’s FM antenna carefully oriented to provide the best possible reception of each FM fringe station (i.e. the wire antennas for the CC Pocket and DT-400W, and the whip antennas for the PL-310ET, CC Skywave and Traveler III). Although the tests were not conducted at local noon, stable FM conditions were ensured to provide accurate test results for relative FM sensitivity. As in the Medium Wave test MP3’s, the first 15 seconds of each MP3 was recorded on the C.Crane Pocket, followed by approximately 15 seconds on the Sangean DT-400W, then approximately 15 seconds on the Tecsun PL-310ET, followed by approximately 15 seconds on the C.Crane Skywave, then finally 15 seconds on the Eton Traveler III. 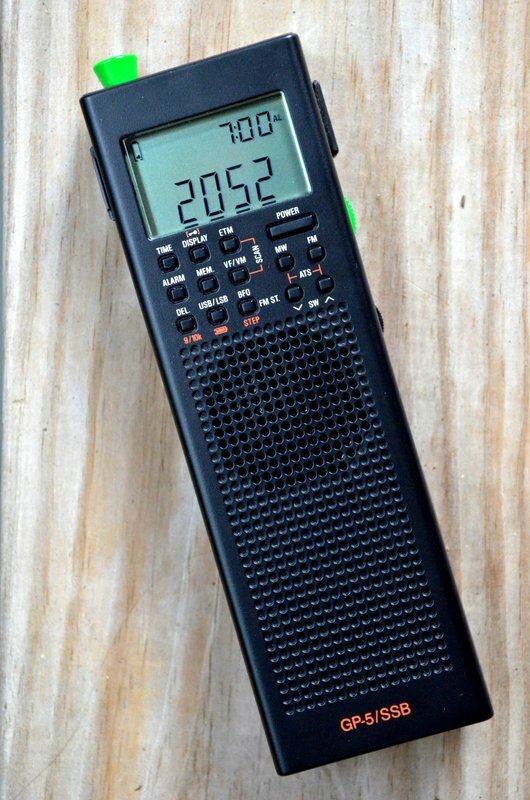 Not much of a contest—the PL-310ET trounces the other radios on all five test signals. Whether the FM fringe station is weak, fair or moderate, the Tecsun’s Si4734 DSP chip provides unequalled reception. None of the other contenders come close, although the Traveler III does lead the rest of the pack in the 102.1 and 106.5 MHz tests. The DT-400W sounds competitive with the Traveler III in the 98.5 and 100.3 tests, though, and probably deserves third place in this competition. Neither the CC Pocket nor the CC Skywave sound very impressive in receiving any of the test signals, though, and deserve to be judged accordingly. The Tecsun PL-310ET’s absolute superiority in FM reception among the Ultralight radio class extends to its sibling Si4734 DSP chip models that were not part of this competition—i.e. the PL-380, PL-606, PL-505 etc. For this test the three models with Shortwave coverage (PL-310ET, CC Skywave and Traveler III) were tested in the reception of relatively weak Shortwave broadcast stations, chosen over a wide spectrum of the Shortwave spectrum. Whip antennas were fully extended, and placed in the optimal position for best possible reception. The PL-310ET and CC Skywave models were set in the 1 kHz DSP filter position, and the Skywave’s tone was set in the default “Music” selection. For these MP3’s the first 15 seconds were recorded on the Tecsun PL-310ET, then approximately 15 seconds on the C.Crane Skywave, followed by 15 seconds on the Eton Traveler III. Once again, the PL-310ET trounces the other models in a very convincing fashion—on each of the five Shortwave test signals. Although the CC Skywave and Traveler III both have extended Shortwave band coverage (up to 26.1 MHz) their lack of Shortwave sensitivity competitive with the PL-310ET makes this minor advantage seem irrelevant. The Tecsun’s Si4734 DSP chip not only provides better sensitivity but better image rejection across the Shortwave spectrum as well, making it the runaway winner in this category. 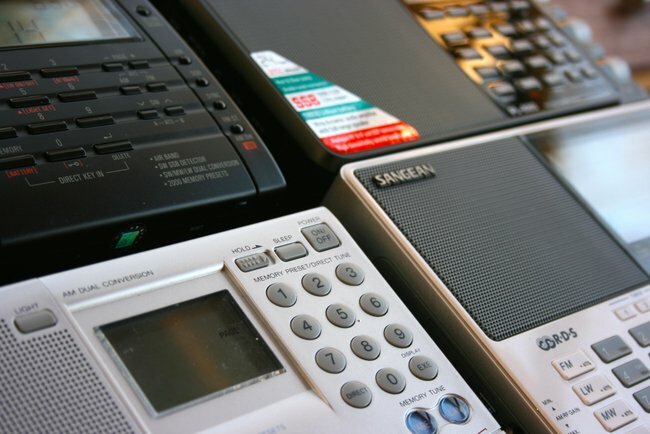 The engineers designing both the CC Skywave and the Traveler III have introduced breakthrough MW-DXing capabilities with the two new models—but improvements in Shortwave performance obviously weren’t part of the design master plan. The Tecsun’s mastery in this category also applies to its Si4734 DSP chip siblings—the PL-380, PL-606, PL-505 and related models. Although most of those models have a whip antenna slightly shorter than that of the PL-310ET, the excellent Shortwave performance of their Si4734 chips still makes them formidable competitors against these new models. For this competition the three models with Weather Band coverage (CC Pocket, DT-400W and CC Skywave) were tested in the relative reception of any Weather Band stations. Weather Band frequency 2 was received on all models– but it was the only Weather Band station received at this somewhat poor location for FM reception. For this single test MP3 the wire antennas for the CC Pocket and DT-400W models and the whip antenna for the CC Skywave were oriented for the best possible reception of this Weather Band 2 station. The first 15 seconds were recorded on the C.Crane Pocket, followed by approximately 15 seconds on the Sangean DT-400W, and finally 15 seconds on the C.Crane Skywave. 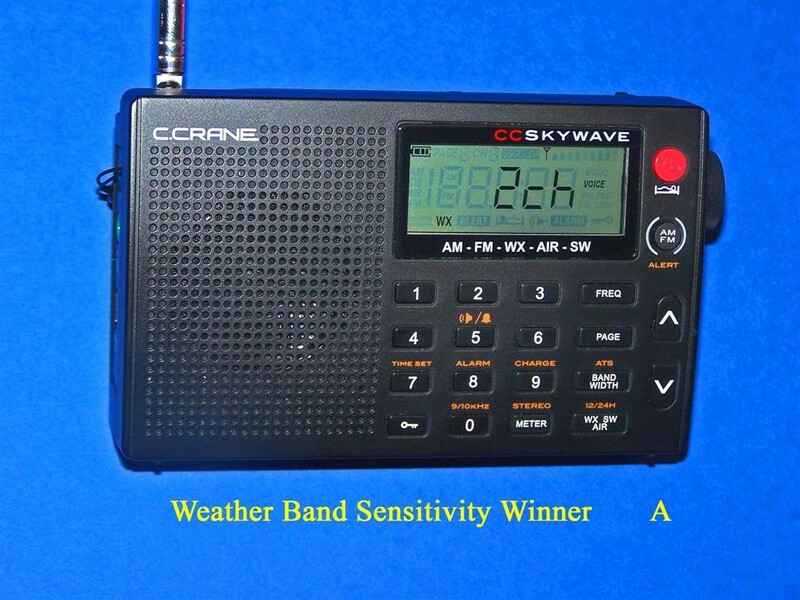 The CC Skywave’s excellent reception of Weather Band 2 is in an entirely different league than that of its two wispy competitors—probably because of the advanced Si4736 DSP chip that C.Crane chose for the Skywave’s Air Band and Weather Band reception. The CC Pocket and DT-400W can compete with each other in Weather Band reception, but have no hope of even coming close to the Skywave. For those DXers who consider Weather Band reception and Alerts extremely important in case of emergencies, the CC Skywave is the obvious choice. This vertical form receiver is a compact and convenient pocket radio suitable for sporting activity, travel and many other functions. C.Crane is to be commended for designing several unusual capabilities into the model in an attempt to improve its market appeal relative to its obvious competition—the Sangean DT-400W. Unfortunately, though, none of those additional capabilities provide it with any type of competitive edge in the rough world of weak-signal DXing. The Sangean more than hold its own in MW, FM and Weather Band sensitivity and in MW selectivity—regardless of which filter is selected in the CC Pocket. To be sure, the 1 kHz step tuning, far more memories, the alarm function, the more powerful speaker, longer warranty and rubber-like trim will appeal to some purchasers, but the Sangean’s “fun factor” is an intangible asset which has kept it in steady demand for 7 years. The CC Pocket’s performance in this ultra-competitive Shootout has repeatedly been at the back of the pack—which doesn’t necessarily mean that it has issues, but more likely that it is not really suitable for an all-out DXer looking for an MW, FM or Weather Band performance edge. For this type of purchaser the $64.95 price ($5.00 more than the innovative Traveler III, for example) will seem excessive—especially in light of the CC Pocket’s lackluster performance in all four of the Shootout categories. 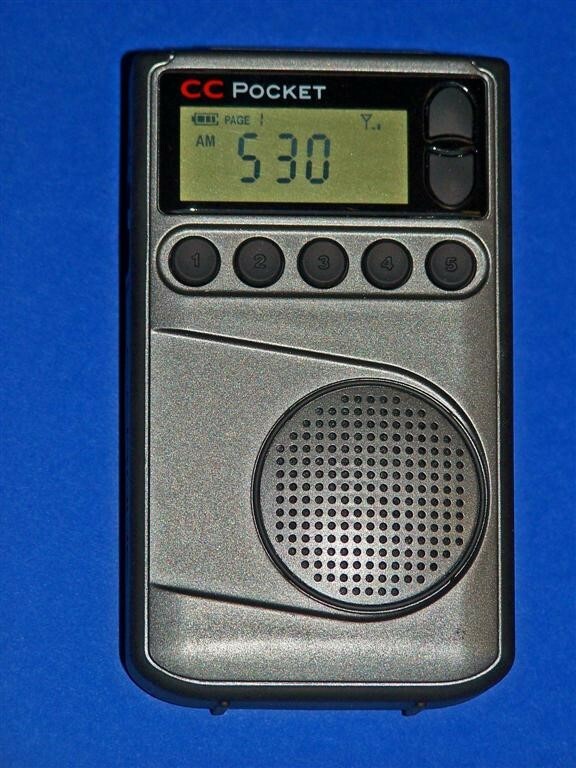 This bright yellow pocket radio performed about as well as could have been expected from a 2008-design vertical form receiver without an advanced DSP chip. Despite its limited loopstick length and lack of any filter choice it had fairly good Medium Wave sensitivity, and usually displayed a slight edge over its CC Pocket competitor in the other categories as well. To be sure it lacks several of the CC Pocket’s versatile features but in competition with that model it excels in the real-world DXing capabilities that really count. DXers who have been captivated by the model’s unique charm and unusually pleasant audio will be pleased with its overall performance in this Shootout—even if it is no longer at the top of the pack in MW sensitivity, selectivity or any other category except for audio fidelity. 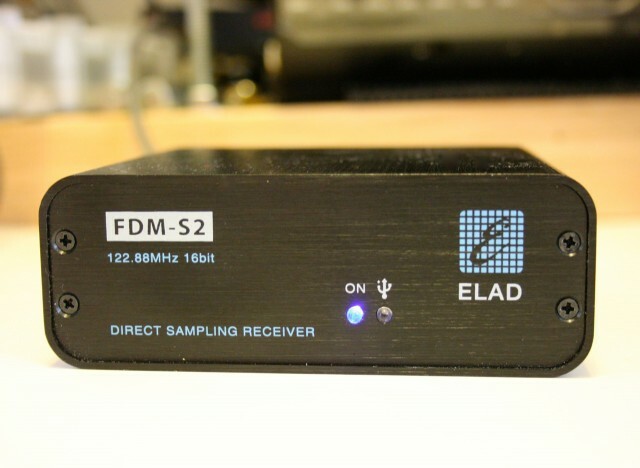 Basically, it provides the best possible MW and FM-DXing performance available in such a small vertical-from receiver—with a lot of fun thrown in as a bonus. One listen of your favorite song on FM stereo (with the Deep Bass Boost engaged) will convince you that the radio is an unusual gem—and that the $57.67 price is a true bargain. 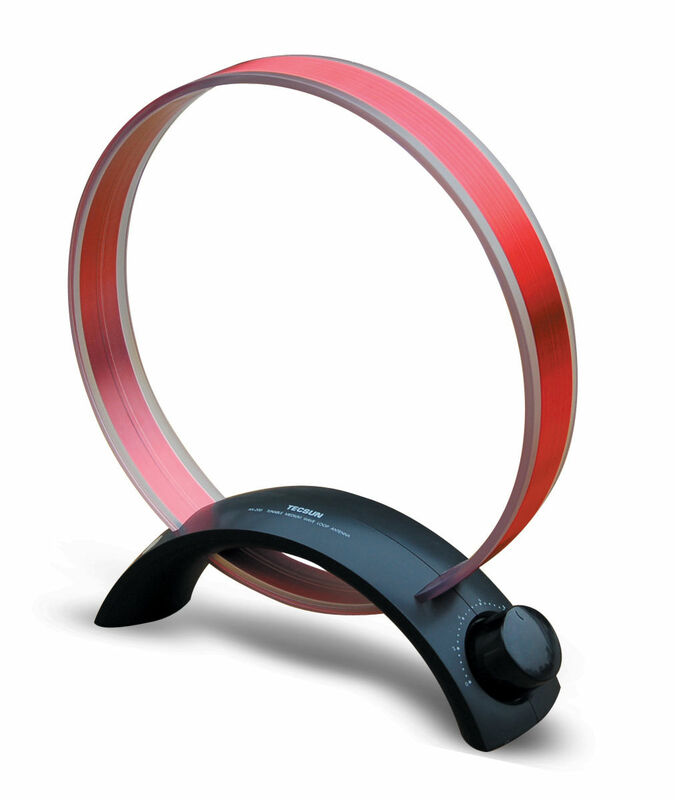 Sangean’s 2008-design model has been a classic good seller for 7 years now—so why change a winning combination? At its introduction in September of 2009 this model led the Ultralight Radio class in almost every category—and in certain capabilities it is still the overwhelming class leader. Its FM and Shortwave sensitivity are in a class of its own, and it is still highly competitive in Medium Wave selectivity. 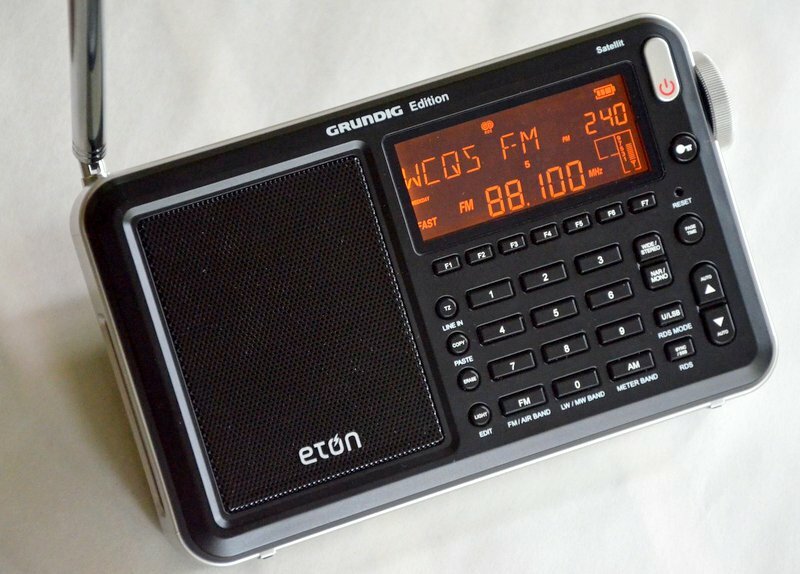 Unfortunately Tecsun has done nothing to correct the MW-DXing quirks of the 2009-design radio—offering manufacturers like C.Crane and Eton an opportunity to introduce new models which correct them very effectively. As such, the Tecsun PL-310ET (and its related models) no longer stand at the top of the Ultralight Radio class in the all-important capability of Medium Wave DXing performance. Breakthrough innovation has allowed the new CC Skywave and Traveler III models to take over the MW selectivity and MW sensitivity honors, respectively. Despite this fact the PL-310ET still has plenty to offer the all-out DXer—including Medium Wave enthusiasts who don’t particularly mind the model’s digital quirks. The multiple display functions, powerful audio amp, advanced digital search functions and superior memory capacity are significant advantages for DXers on any band, and hobbyists who have become accustomed to these features may be reluctant to part with them. A related model (the PL-380) has become a favorite for Longwave loopstick upgrades combined with 1 kHz DSP filtering—a capability which no competing model possesses. 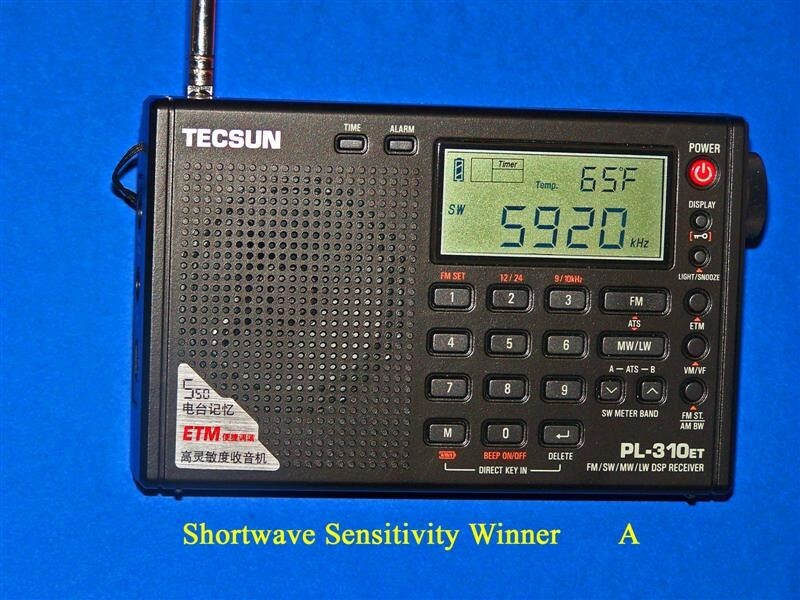 For FM and Shortwave-DXing enthusiasts the model (and its Tecsun siblings) are really the only serious choices, with weak signal performance in a higher league than any competing model. In summary, despite the fact that its MW performance has finally been upstaged (after over five years), its $49.89 price is a true bargain for all of the DXing performance that the radio still offers. By correcting all of the Tecsun model MW-DXing digital quirks and introducing breakthrough Air Band and Weather Band capabilities as well, C.Crane has created a dream portable for both Medium Wave split-frequency DXers and worldwide travelers as well. 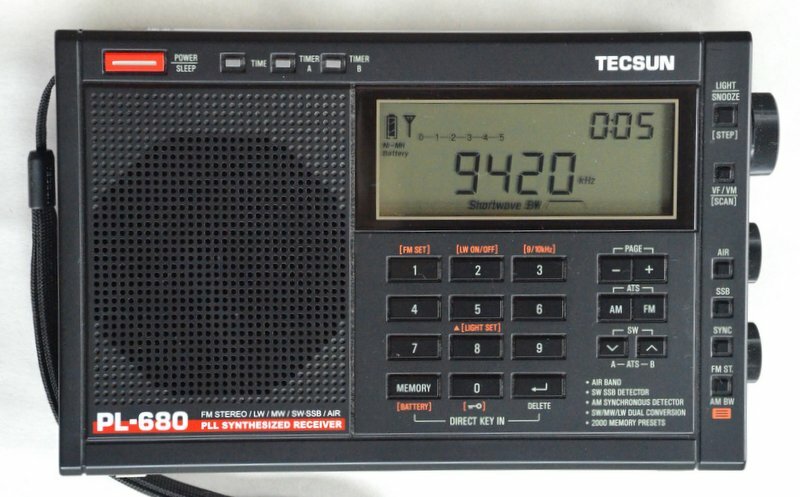 Although it lacks many of the Tecsun’s digital search, display and memory capabilities and costs significantly more, its unusual combination of excellent MW sensitivity, very effective 1 kHz DSP filtering and improved DX station audio is enough to motivate most Ultralight class transoceanic DXers to come up with the cash. Concentrating on both Medium Wave performance and the new Air Band capability, C.Crane is to be commended for their innovation in developing such an innovative new pocket radio, having excellent versatility and build quality. Although it gets slightly edged out by the new Traveler III in MW sensitivity and nulling ability it has excellent MW sensitivity itself—and leads the Ultralight class in MW selectivity . 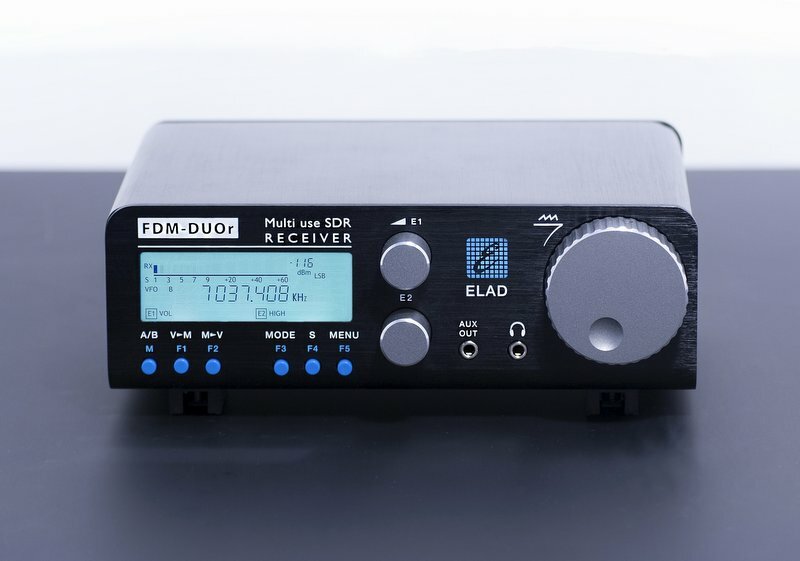 That combination enough is to make it the new transoceanic DXing Ultralight radio of choice—and satisfy the desires of many hobbyists who have waited years for a manufacturer to correct bogus heterodynes, “soft mute” and unbalanced 1 kHz DSP audio. 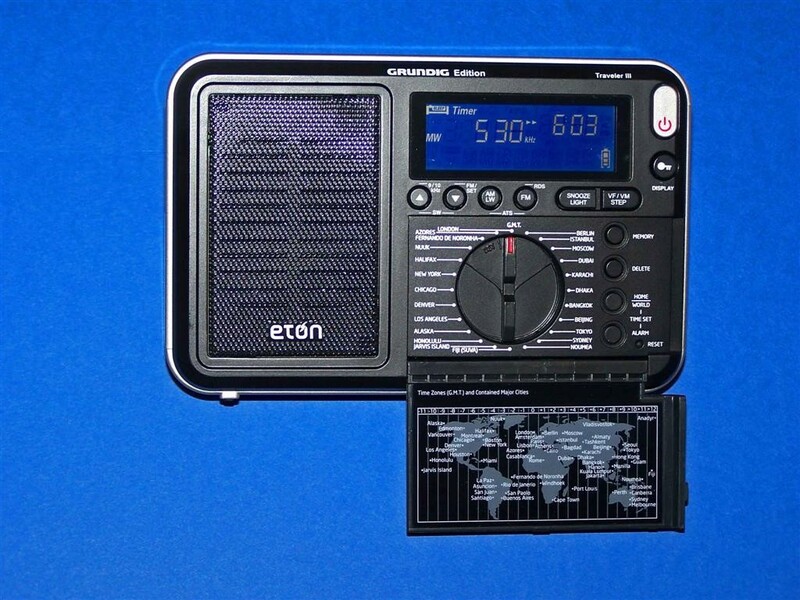 For domestic MW-DXers who would also like relief from these irritants but who feel that the C.Crane’s $89.95 price is “sky high,” Eton’s new Traveler III is the dream alternative. 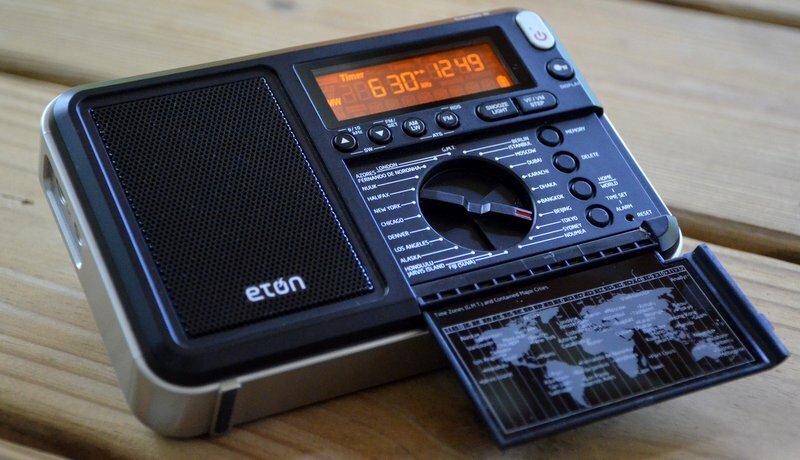 Domestic MW-DXers will be pleased to know that innovation and creativity are alive and well at the Eton company—which has created the most sensitive (and stylish) MW-DXing pocket radio ever to exist on the planet. Although it lacks the Skywave’s breakthrough split-frequency capability it also corrects all of the Tecsun models’ MW digital quirks, and introduces an exceptional nulling capability as well. The Traveler III has a few minor digital quirks of its own but these are insignificant in comparison to its outstanding combination of MW sensitivity, audio fidelity and nulling capability—making it a true pleasure to seek out weak MW signals. The new Eton model’s innovation does seem to be concentrated on MW performance at the expense of the other bands and its lack of DSP filtering options will probably not satisfy split-frequency DXers in need of the best possible selectivity, but its single filtering option is relatively effective, and in combination with its outstanding nulling capability it can occasionally dig out very weak MW signals adjacent to strong locals. Its $59.99 price is a true bargain for domestic MW-DXers in search of the best possible sensitivity, audio fidelity and nulling capability—and the stylish cabinet design, display appearance and carrying case may well provide this new radio with an intangible “fun factor” as a major bonus. Now that you have the most detailed Ultralight radio purchasing guide on the planet, why not take the plunge, and invest some minor pocket change in one of these new innovative new pocket radios? 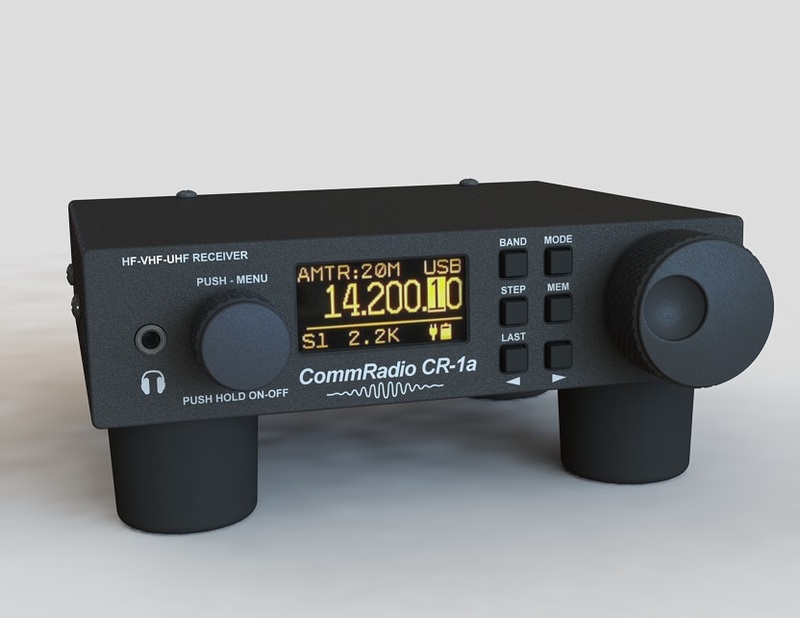 Whether for serious DXing or for travel reception, these new models provide amazing new capabilities far beyond the humble pocket radios of the last century. If you grew up as a teenager with such a transistor radio introducing you to the thrills of DX, you will discover that the thrills of DX have taken a quantum leap with these astonishing new models. So go ahead and make your choice—and discover the unique thrills of chasing rare DX with a highly advanced pocket radio! The 1,500+ member Ultralight Radio Yahoo Group waits to welcome you, and provide you with all the assistance you need in providing a major boost in your hobby satisfaction. Gary, again, many thanks for this excellent review! A large percentage of SWLing Post readers are also MW & Ultralight DXers–I plan to start posting more on this topic. Your posts are always welcome! Below, I have listed all of the radios in this review along with links to retailers that sell them. This entry was posted in AM, Articles, Guest Posts, Mediumwave, News, Reviews, Ultralight DX and tagged C.Crane CC Skywave, C.Crane CC-Pocket, Eton Traveler III, Gary DeBock, Gary DeBock Ultralight Radio, Sangean DT-400W, Tecsun PL-310ET, Ultralight DXing, Ultralight MW DX, Ultralight Radio Comparison, Ultralight Radio Review, Ultralight Radio Shoot Out on March 22, 2015 by Thomas.